Veteran - have the command base with a mounted officer. Many unit leaders still led their troops on horseback in this conflict, so this gives an opportunity to show that. Regular - the usual officer, flag and musician on foot. Green - the command base has an officer and musician, but no flag. There are other ways of doing this, eg. all Turco and zouave troops can be used for veterans. The cavalry had a greater variety of uniforms, making differentiation easier, eg use cuirassiers as veterans. They could also be differentiated by other additions, eg, the unit's dog mascot included on a base. The German armies often had a wider variety of flags, especially the Prussians. I often use units with the old style flags as veterans, the standard post Napoleonic flags as regulars, and the recently incorporated states, eg Mecklenburg and Saxony, as green. 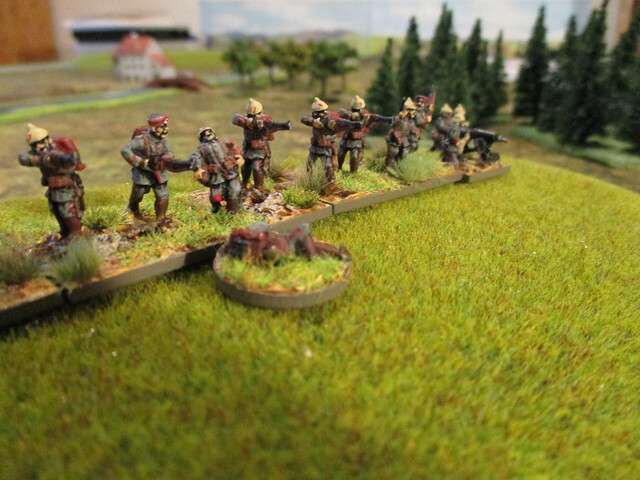 With the French Chasseurs I rely on the command colour flash on the rear of the command base. This can also be used with the German jaeger units, but some of the incorporated states had jaegers in blue with green facings (eg. Mecklenburg) so again these poor chaps get a green designation. Does anybody else have eye-catching ways of differentiating veteran, regular and green? Got a game of WS tomorrow using the new cards. Will do a report, but now feeling guilty about pictures as I am afraid that computer technology completely overwhelms me (and went some considerable way to ruining the enjoyment of my career). I like the Dark Ages, particularly the early post-Roman period, but I am now beginning to find I would like a go at the Viking era. I am seriously considering making this my 15mm project for 2019 using PP figures and rules. Doing a bit of research I had a look at the Little Big Man site to see if they did 15mm Viking and Saxon shields. They do, but not specifically for Peter Pig. They do them for about half a dozen other companies. Has anybody used these with the PP figures, and if so which are the most compatible with the PP shields? Great to see the newly added dismounted dragoons and prospective cuirassiers with plume and sash for the ECW. Any chance of some additional heads specifically for the cuirassiers, such as the burgonet with big cheek pieces, the barred visor or a helmet that looks almost like a face. the Osprey on ECW cavalry shows a nice variety of helmets. Is it pompous calling it the studio? 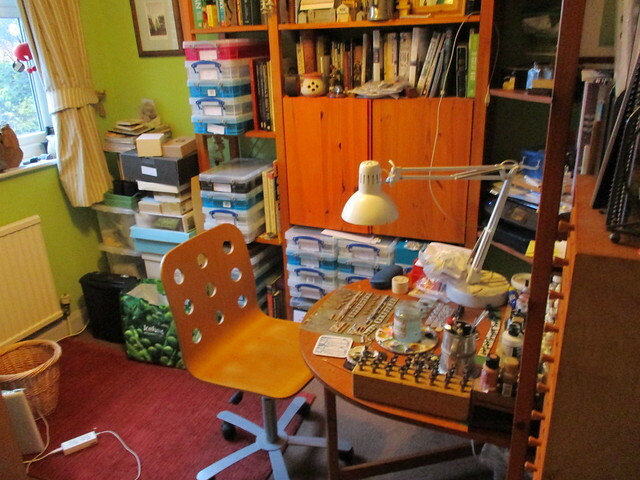 Anyway, after giving up my wargames room so that my son could have his own living room/mini music studio, and after much upheaval and moving of books, furniture, figures, paints and visits to the tip, I have turned my old study into a much reduced library, figure storage area and painting room. 15mm, 10mm, 6mm and 3mm on the painting table at the moment, with a determination to finish the lot before priming anything new. 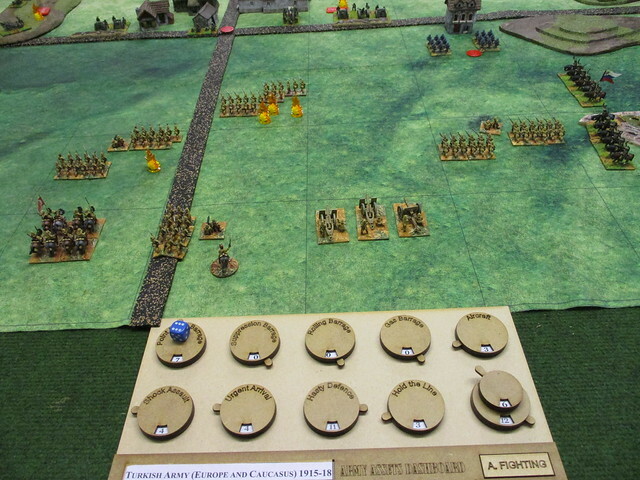 First the 3mm ACW for some Altar of Freedom games. The recent spate of Confederate Generals and personalities (just noticed the welcome addition of Mosby) is a much appreciated extension of the ACW figure range. For completeness in the western theatre (and early in the east) might I suggest Joe Johnston with his very distinctive goatee. Came as an Email today from the BBC - drama documentary in two parts about the last 100 days of WWI (presumably focusing mainly on the Western Front. Aims to show how infantry, tanks, aircraft and artillery at last began to co-ordinate in the attack.The three stills from the programme look vert impressive. First part Thursday 25th October, 20:00 BBC2. Nothing to worry about folks, but owing to a slight change in circumstances I am going to be spending most of the next 3 months reorganising and decorating my house, which will certainly slow down the painting and limit the number of games I can be involved in, so I probably won’t be posting many photos on the PP site before the religious festival where the majority focus on the material (I’m sure even the pagans saw it as a time for reflection). I intend to come back with a first look at my new wargaming home set-up, which should give me more elbow room than before. Meanwhile I’ll keep posting re. my activities with the Dayshift crew of the LWA. Introduced a Walter Schnaffs player to real Square Bashing. He ended up being the Russian defender, with a shed load of reservists. The Turkish attackers also had a load of reservists, so fun sure to ensue. 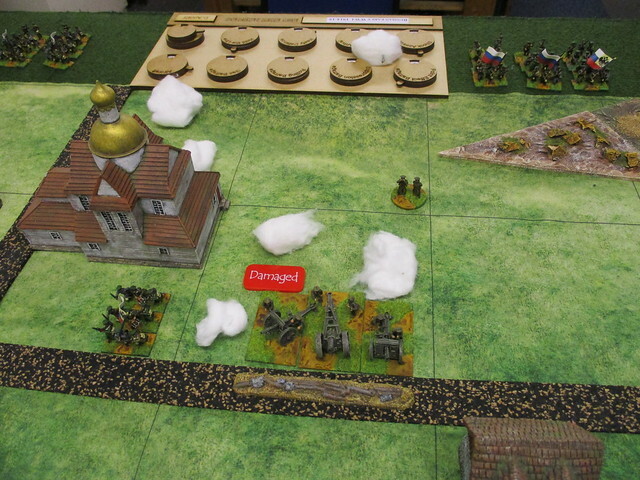 We set the scenery as hilly and rough Caucasus terrain. We played three full turns on Wednesday, with the intention of finishing next Wednesday. 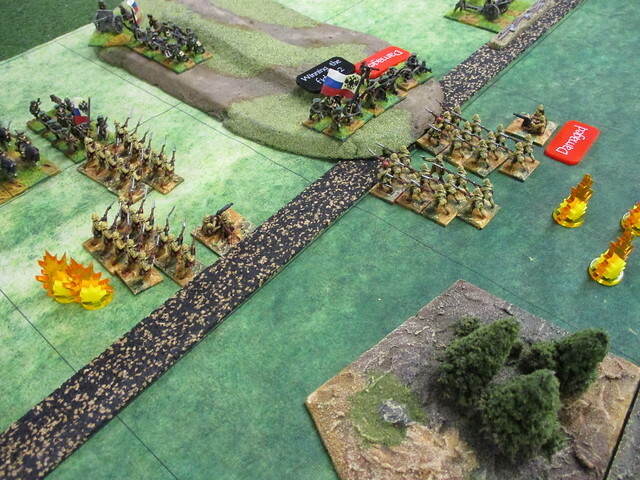 There were some vicious clashes, with Russian reserves turning up with alarming regularity. The Turks, however, looked as though they could break through to the rear of the Russian area. 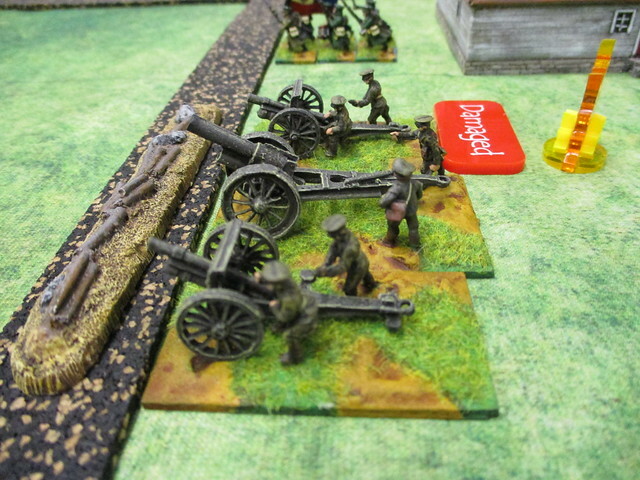 The figures belong to the Liverpool Wargames Club, and have been based for rules where individual figures are removed, thus giving us the half base. 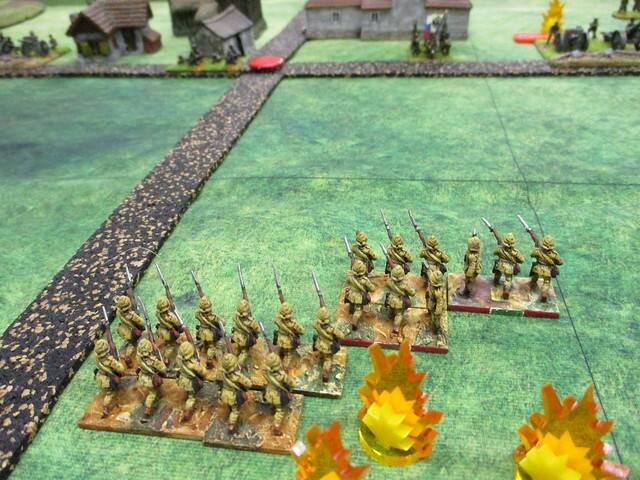 There are no casualty figures, so we used my GF9 explosions for morale markers. 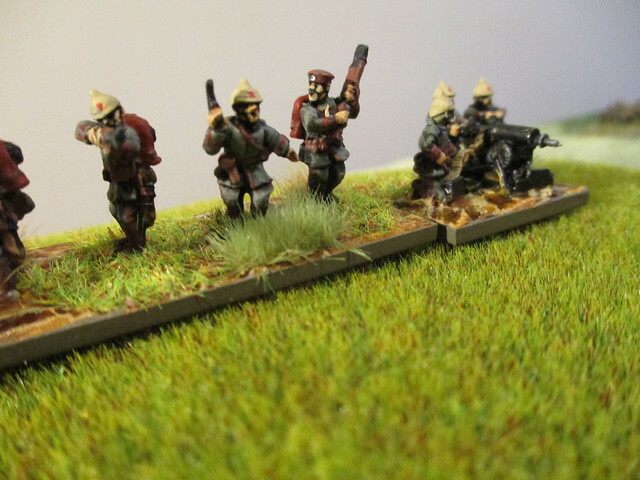 I think the figures are old Minifigs from the 1980s (in fact I believe the Russian infantry are actually Napoleonic). Anyone going to Colours this year? I shall be attending with the Day Shift group from the LWA - we are the ones who meet up in the mornings, usually once a week, to play historical games only, in a very civilised atmosphere, i.e we play for fun and wash every day! At Colours we are putting on a 28mm participation game of Ronin (Osprey) with custom scenery built by one of the members. Anyone is welcome to come and have a game. After a bit of trial and error trying to find something that approximated my understanding of early war German field grey I came up with something that seems to work. 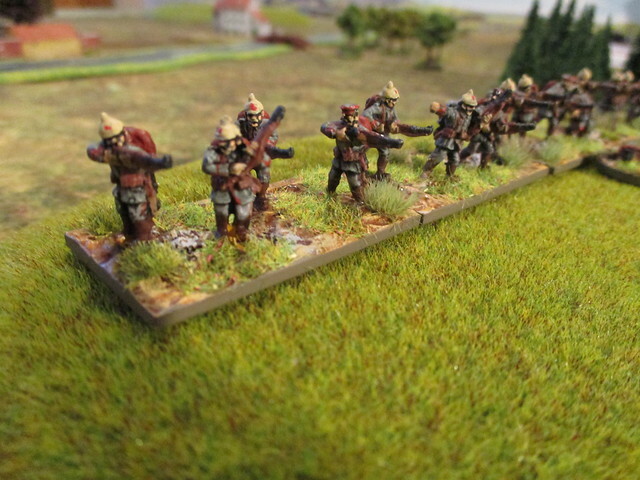 These are my first 1914 German infantry. I tried a few feldmutze head swaps as well. For the tunic I used an approx 4:1 mix of Americana Slate Grey and Vallejo Green Sky. For the trousers I used the slate grey on its own. I then applied a generous coat of Citadel Nuln Oil shade (wash) which tones down the green considerably and also darkens and shades the trousers. I applied the rest of the paints over this, giving the flesh a wash of Citadel Reikland Flesh Shade. Once dry I painted a coat of Vallejo Satin Varnish, then a coat of brown magic wash and finally a coat of Windsor and Newton acrylic matt varnish. the basing was done firstly with a layer of Windsor and Newton Modelling Paste, applied with a Games Workshop plastic spatula (really useful as it has a large end and a thinner end for getting into narrower gaps between the figures) which came as part of a three tool sculpting kit. Some sand and small grit was added to a few areas at this stage to represent stones. The whole base was then painted Crafter’s Choice Yellow Ochre, then given a wash of Citadel Seraphim Sepia Shade. The base was then dry brushed Vallejo Tan Yellow and the stones carefully dry brushed Vallejo Light Grey. Where some of the sepia wash had pooled I painted Vallejo gloss varnish to represent puddles. The bases were then edged using Miniature Paints Earth Brown. Finally static grass and tufts were added using PVA glue. After languishing in the lead mountain for several years I at last got around to painting up the BEF. There were several reasons for this, not least that I have been reading some pretty good books on the opening months of WWI, with plenty of scope for relatively small scale scenarios (e.g I am currently reading up on Nery, 01/09/14 or 09/01 for those across the pond). I was also struggling for a colour scheme. As far as I am aware no acrylic paint company produces a colour specifically for 1914 Tommies. However, I have recently come across Vallejo green brown and also green ochre. The green brown on its own is ideal for officers’ uniforms, and a little (approx. 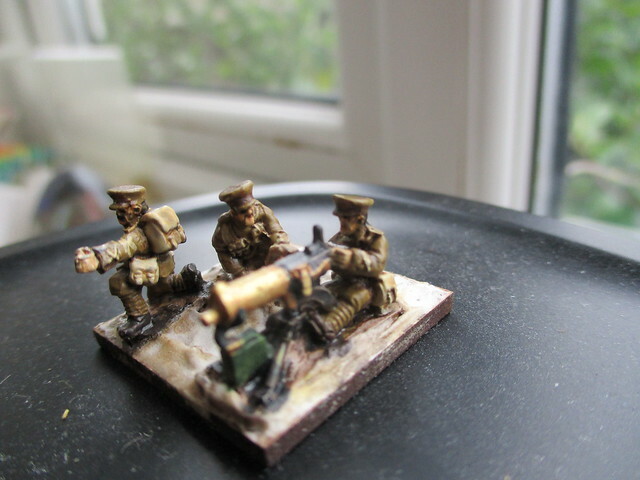 3:1) of the green ochre makes a great colour for other ranks. I used Vallejo buff for the webbing and Vallejo German camo black brown for the shoes, having read that the men were issued with brown shoes which they then blacked. 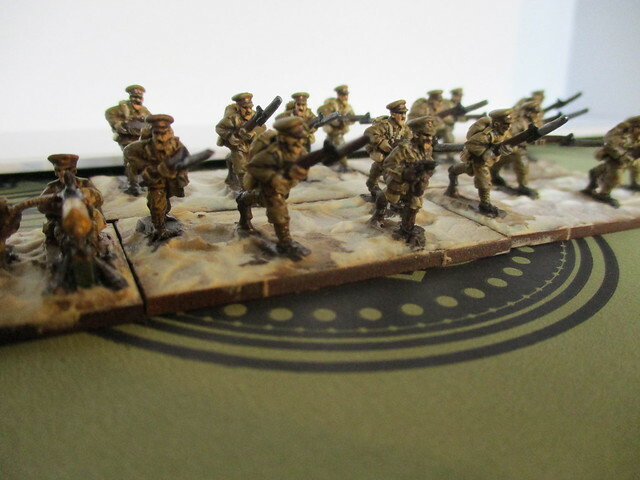 I finished the figures with Vallejo satin varnish mixed with a few drops of Army Painter soft tone ink wash, and when that was dry I applied a coat of sepia magic wash so the figures ended up protected and shaded.